Genealogy Records: A History of Regional Coverage in the U.S.
Introduction: Duncan Kuehn is a professional genealogist with over eight years of client experience. She has worked on several well-known projects, such as “Who Do You Think You Are?” and researching President Barack Obama’s ancestry. In this guest blog post, Duncan discusses the availability of genealogy records in various regions of the U.S. She concludes with a genealogy case study showing how old newspapers helped her break through a brick wall in her own family history research. When researching family history in the United States, you will find vast differences in the availability of genealogy records in various regions. This is due to a myriad of reasons, including: who initially settled the area, what government was created, what occurred during the region’s history, what records were preserved, and the availability of those documents today to the researcher. In this blog article, I’ll provide a quick overview of three major geographic areas in the United States: New England, the South, and the West. In each region, I will briefly discuss three issues from a genealogist’s perspective: settlement, government, and history. Keep in mind, to cover hundreds of years of history in such vast regions is not fully possible in a few paragraphs. Therefore, you will want to do additional research about your area of interest. Although the extent of official government records and other vital records about your ancestors may vary from region to region, there is one constant that is true for all areas of the country: old newspapers, such as the large online collection in GenealogyBank’s Historical Newspaper Archives, are a great genealogical resource. At the end of this article, I’ll present a case study from my own family history research, showing how two 1895 newspaper articles let me finally break through a brick wall I had with one of my ancestors. 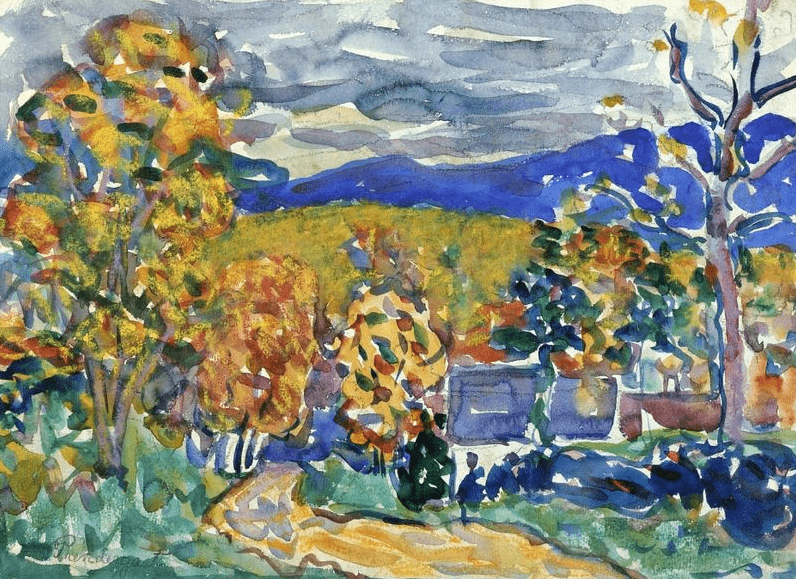 Painting: “Autumn in New England,” by Maurice Prendergast. Credit: Wikipedia. Many diverse groups settled New England originally. Some came looking for the freedom to practice their religion, others to create a new utopia—but they had many things in common. The settlers generally believed that their local government was created for the benefit of society and should be actively supported, participated in, and abided by. Also, they were largely a well-educated people. These factors led to the creation of excellent community and church records, which delight current genealogical researchers. For example, records exist for the large majority of marriages that occurred in New England prior to 1700! One book, New England Marriages Prior to 1700 by Gary Boyd Roberts, provides a “comprehensive listing of the 37,000 married couples, their marriage date or the birth year of a first child, the maiden names of 70% of the wives, the birth and death years of both partners and their residence.” From the earliest days of their settlements, these educated, orderly people were keeping detailed records. The keeping of vital records (birth, marriage, and death certificates) was instituted statewide in this region earlier than anywhere else in the country, beginning in the mid- to late-1800s in most cases. Contrast that history of record-keeping with some of the other regions of our nation, and you can see how unusual these records are. New England has also had many thriving newspapers throughout its history, which provide coverage from 1690 to the present. 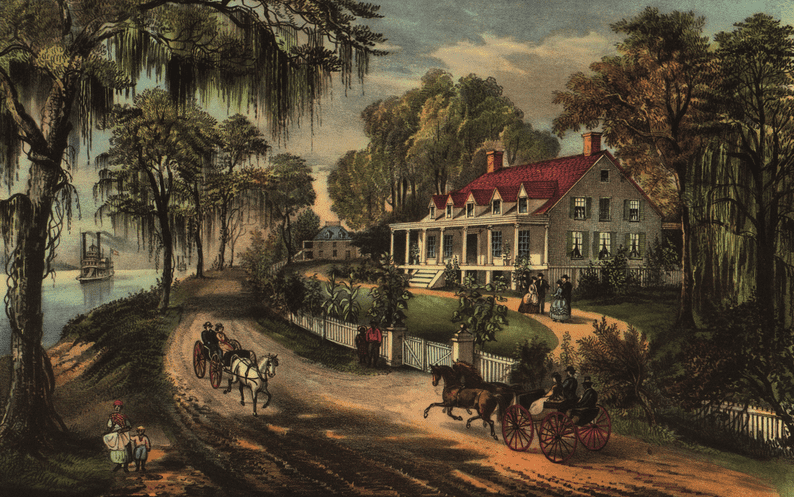 Painting: A Home on the Mississippi, by Currier & Ives. Credit: Wikipedia. The diverse groups that settled the South came for entirely different reasons than most New Englanders. They were here for economic reasons. The government and laws they created were primarily to protect their business interests. It was for the most part an elitist society where only the wealthy were allowed to vote and authoritarian rule was the norm. The majority of the population consisted of undereducated, poor workers and slave laborers who were not represented. Southerners were naturally distrustful of government and did not institute the official keeping of vital records until much later. Some Southern states did not begin recording this information until the early- to mid-1900s! Even census records can be challenging to use because Southerners would often provide middle names in one census and first names in the next, or only initials—particularly in the 1860 and 1870 censuses. During the Civil War, Union soldiers intentionally targeted Southern courthouses to destroy records naming slaves as property. The first records that were reconstructed following the war were land and property records. Land was wealth that needed to be authenticated and protected. These reconstructed land records list the person currently owning the land and often an explanation of where they got it. This can include land received from a relative and, in some cases, their relationship to that person, which is invaluable documentation for genealogists. Land records are often called the “bread and butter” of the South by family historians, meaning they are the necessary documents to use in your research. Tax records may have survived which will show men coming of age, and can be used to get an approximate age of an individual and the names of potential family members. Kentucky is one example where excellent tax records are available. Court and probate records, where they still exist, are priceless and can provide an abundance of crucial information. Southern church records can be another excellent source of birth, marriage and death information (as well as membership details). Of course, newspapers are also excellent records. In addition to courthouses, Union soldiers also targeted newspaper printing presses, because newspapers were the main source of information for most people. Because they were in danger of destruction, some Southern newspapers temporarily suspended operation or moved further South where it was safer. The good news is that even if a particular newspaper and its archives were destroyed, many of its articles had been picked up and printed by multiple other papers and can still be found. 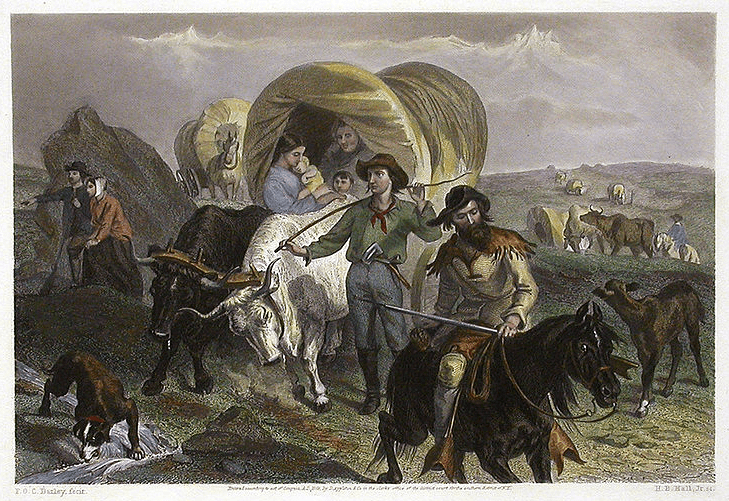 Painting: Emigrants Crossing the Plains by F. O. C. Darley. Credit: Wikipedia. The West is an idea as much as a place; it brings up images of frontier towns and vast prairies. “The West” meant anything on the western border of civilization, which had different definitions during different time periods. It can mean the western edge of the colonies, west of British King George III’s 1763 proclamation line, west of the Mississippi River, etc. The people attracted to this frontier life were those escaping persecution from the rest of society, or those with a pioneering spirit. Although white people lived west of the proclamation line prior to the king’s declaration, the main western push was in 1798-1819. In addition to Dutch, German, and Polish people, one predominate group that settled west was the Scots-Irish. These people were often marginalized and used as a buffer between the Native people and the colonies. They had a fiercely independent spirit and were quick to move if an area became too populated, which can make them hard to track. They did not have “regular schooling” and did not keep many records. In fact, they were often hostile to record keepers such as tax collectors. News, on the other hand, was prized in these small communities and people often gathered to drink and share information. Newspapers played a vital role in communicating information throughout the West. Of course, this brief description of some of the larger regions of the nation excludes vital and colorful histories such as Texas, French Louisiana, Spanish Florida, and Native peoples, to name just a few. When conducting your own genealogy research, spend some time getting to know the area your ancestors lived in: why it was created, what government agencies had jurisdiction over it, what records were created, for what reasons, and where those records can be accessed. County histories are a valuable source of information, as are finding aids for the county in question. Try searching the county or city name on Google or Bing to see what information can be found. Look for all the records that might exist such as newspapers, land records, tax lists, church records, cemetery records, etc. Newspapers are a crucial genealogical resource for all time periods. Historically it did not cost readers anything to publish news in their local paper, and they used newspapers very much like we use Facebook and other social media sites today. Information in local newspapers can give the reasons behind events, and sometimes supply information to replace missing vital records. It is worth keeping in mind that news and information can travel, even if your ancestor did not. There are a few things to note about these two newspaper articles. First, you’ll notice that his name in one article is spelled “Zachariah” and in the other it is spelled “Zacariah” without the middle “h.” You will want to check multiple spellings for a name, or search using an asterisk (*) as a wildcard to cover various possibilities. Second, you’ll notice that the articles give slightly different information, emphasizing the importance of viewing multiple articles about the same event. One tidbit in the second article is the term “wealthy farmer.” The 1860 census lists his estate at $2100, which is sizable but not outlandish. Apparently it had grown by the time he died. This is a reminder that I should look through the probate records for his will. Last but not least, you will notice that one of these articles was printed in a Michigan newspaper, while the other was from his home state of Indiana. And as I mentioned, Grandpa Nicholson was from a very small town in Indiana—and yet a Michigan paper reported his death! As far as I know, there are no family connections with Michigan. The Jackson Citizen Patriot appears to be publishing information that would appeal to their readers in general. Perhaps some of their readers were from Southern Indiana or had business interests there. The point is: begin by doing a wide search, because information about your ancestor might turn up in newspapers published where you would not expect it. I was surprised to find something about my small-town grandfather by doing a nationwide search—but I’m awfully glad that I did. I am grateful for these newspaper articles about Zachariah because they are the only documentation I have found to show when and how he died. Newspapers publish information from all around the country. Make sure you cast a wide net when searching for your ancestors in GenealogyBank because you never know where you might find information about them. For Southern family history, probate records (called the “Court of Ordinary” in Georgia until 1980s), where they exist, can give details of the heirs of the deceased, especially in the final settlement report made to the court by the estate administrator (usually no will) or executor. Wish more probate records were available online! Deed records also can give clues of kinship, especially when all of the heirs sign away their claim to property being distributed from an estate. Take the time to figure out how they are all kin! You are absolutely correct Eve! Probate documents are such a vital resource with excellent information. Even when the relationships are not explicitly stated in deeds and probate records, they can provide vital evidence to build a circumstantial case.